Road conditions: Well maintained and fast-moving. Speed bumps are numerous but well marked. Few tolls. We arrived at the Mexican border too early (6 am) and had to wait for the official to come to work and stamp our passports. This border crossing was hyped as a massive headache and also dangerous, but ours was uneventful. We crossed in Tecate, about 45 minutes east of Tijuana. Tecate is much smaller. Fees: 340 pesos per to enter the country per person at an exchange rate of 12.50 pesos/$1 U.S., and a $200 U.S. dollar deposit for the cost of the entering into the country with the car. The $200 we were able to collect upon leaving the country, and our car was searched very lightly after we piled out. It’s difficult to equate towns to significant landmarks in Baja because we were exploring the endless amount of unmarked beaches. We never encountered any regulations about camping on the beach because there was rarely anyone around, so we were able to pull off the road and sleep where we wanted. Baja is very sparsely populated--“newly” settled compared to the mainland. Inland, there is only uninterrupted desert. Towns served as supply stops or a place to use wifi for a minute. As we got closer to the capital city of La Paz and Cabo San Lucas to the south, supplies became more expensive. We spent a few days in San Quintin at Don Eddie’s, which is more outpost than town. It has a little bit of everything: sport fishing, restaurant, RV parking, wifi, and motel-like accomodations. 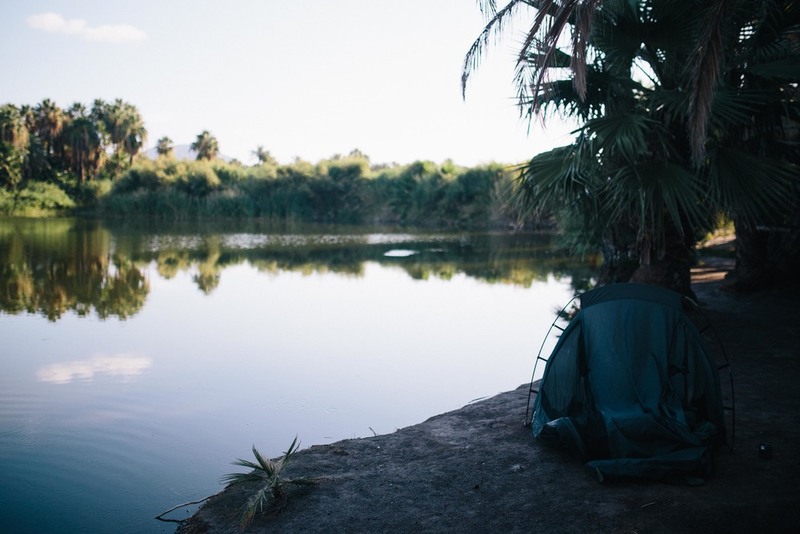 The landscape started to change about halfway down the peninsula as we headed to the East Coast on the Sea of Cortez, and we encountered palm trees and a freshwater oasis at San Ignacio. We paid about 160 pesos per night (total) for the 4 of us, to rest in open-air palapas beside the oasis. There is plenty of sun in Baja, and after awhile it can get draining, so make sure you bring your own shade. We found our Fiamma awning from GoWesty to be pretty crucial. Water is also very important, and we stored ours (along with extra gas) in four jerry cans we secured on our GoWesty swing-away arm mounted our bumper, as well as a spare tire and a Trash-a-roo on a swing-away arm on the opposite side. We took the Baja Ferries boat to the mainland. The experience on the boat was pleasant, but we were slammed with two unexpected fees after purchasing our tickets at the office in La Paz. The tickets themselves cost 1,102 pesos a piece for Joel, Parker and Madison. The cost for the car included Aidan’s passage, and was 3290 pesos, and included for each person is the cost of two meals (dinner and breakfast) on the 18-hour ride. After all our paperwork was sorted (needed: title in your name, passport, immigration slip), we were driving towards the boat to load up when a man who wanted 160 pesos for “use of the harbor” stopped us. We paid up but weren’t happy about it. This is a frustrating aspect about Latin America. The lack of proper signage explaining when and where you’ll have to pay fees, or signs with the true cost of goods and services, make it difficult to know when/if you’re being ripped off. For a little more money you could stay in a cabin with a private bathroom. The area for the passengers without cabins had rows of cushy seats, with a large TV in the front. Sleep was a little difficult to come by and it looked like people who regularly rode the ferry brought blankets with them because the A/C was extremely cold after the first 8 hours. Things to bring next time would be another liter of water, a few snacks, and a blanket—pretty similar to a long plane ride. Altogether, though, it was a pretty pleasant boat ride, we were fed, we were able to go up to the top deck and watch the sunrise and sunset on the water, and we watched movies all night. We made sure to arrive two hours early as advised at the ticket office. We bought our tickets the same day, but the next option was four days out, so if you’re on a tighter schedule it might be a good idea to get them in advance online. Every night's a slumber party in the van. Favorite beaches: West Coast: Punta Santa Rosalillita, just south of the town with the same name, aka The Wall to surfers. Cost? Free. East Coast: Coco, about 10km south of Mulege, tucked in Bahia de Concepcion (100 pesos a night for the four of us). Road conditions: slow moving with lots of speed bumps on non-toll roads; fast, well-maintained, but expensive on toll roads. After an 18-hour journey across the Sea of Cortez, we arrived in Mazatlan, in the state of Sinaloa, pumped to be on the mainland. We located the Funky Monkey Hostel, a place we had heard about in La Paz. It’s secure, colorful, spacious, and homey. Besides the normal hostel offerings, there’s a pool, which makes Mazatlan’s climate a little more bearable, and laundry for 40 pesos. We were there for 5 days while doing a work exchange, and Salem—the owner--hooked us up with discounted visits to Mazatlan’s water park and movie theater, activities that felt luxurious after Baja. A ten-minute walk from the Funky Monkey could take you to the beach, (where Parker caught some waves, and found a fun left called Camaron), or to the best smoothie shop in the world, The Oasis. 30 pesos got you a liter smoothie with fresh fruit and basically anything else you can think of (or bring along). The hostel’s vibe is low-key and friendly, and there are invitations everyday to get out and do something in Mazatlan from the staff and from the people we met there. We lucked out with the Funky Monkey, and realized that on the mainland we weren’t going to be able to camp wherever we pleased like in Baja. There were just too many people. So we started putting out feelers on Couchsurfer for places to stay as we drove across the giant mainland. Our next stop was the town of Tepic in the state of Nayarit, where we were capitalizing on a connection we made via a friend in San Ignacio. Tepic is 3 hours south of Mazatlan. We stayed the night at the home of our new friend Pablo, enjoying his insight into Mexican culture, but didn’t see much of the town. After a last-minute debate in the van about whether to continue on to Guadalajara or check out a beach town we’d heard about from our host, we took a chance and went further south to Sayulita. The small town sits on a gorgeous piece of coastline, and appeared to be a vacation spot for foreigners and a few native Mexicans alike. Its development as a destination for vacations and as a sort of New-Age hippie outpost means it’s quite spendy. That being said, it’s very beautiful, with many artisanal shops and eateries, a variety of waves, and bars on the beach. There are a few yoga studios in town, and every other restaurant advertises organic, locally sourced food. We agreed it would be an amazing place to come back to if we had cash to blow. There are plenty of places to stay between hostels and designated camping, but after trying for most of the afternoon, we couldn’t find anyplace that would let us park the van for free. As luck would have it, an American couple with a family approached Parker, interested in the Minnesota license plates on the van. When they heard our story they invited us to park the van in their driveway. There are a handful of bars in the centro, the town center, that are extremely fun, and whose menus would’ve been at home in any metropolitan bar. We were taken to a local spot that will forever remain unlocate-able because Madison and Aidan had a little trouble finding their way home. The biggest lessons from Sayulita: people are kinder than you’d believe, and beware of mescal (a 100-proof agave-based alcohol that’s smoky like bourbon). Driving in mainland Mexico is better than the mental picture we had. We opted to take non-toll roads against advice we heard to save money, and didn’t encounter any danger. The biggest hazard is the unmarked speed bumps that pop up out of nowhere. Even the ones with signs can be hazards, too, if you’re only given a small window to slow from 45 to 25, which happened often. We never drove at night. We did get stopped a few times by police, once just because the officer was curious and wanted to talk to some U.S. citizens, and we were searched only once outside Cancun. For driving in Mexico, you need the title for your car in your name, driver’s license just in case (U.S. license seemed to work fine), your passport, and insurance, which can’t be purchased at the border, but you can purchase it online beforehand in the States for about $170 U.S. dollars, which covers 6 months. Military checkpoints are frequent—popping up every day. They might ask to see passports or open the door on the van, and in our experience one of these two things will be enough and you’ll get waved on. We didn’t pay any bribes. One thing that seemed to help was doing our homework before the border about what paperwork we’d need to have on hand for the car, taking care of it before we entered the country, and then always having it handy. We heard two different accounts about paying off cops from people we met, and both times they didn’t have the title for their car. We tracked down a lead for places to stay after Sayulita on Couchsurfer, and drove to meet our host, Edgar in Guadalajara. Aidan and Madison opted to sleep in the van. The next night, Joel joined, and we had to pop the top. It made us a little more conspicuous, but camping on the street was much better than we thought it would be, with just one overly curious person. Guadalajara’s massive Sunday market gives Wal-Mart a run for its money: it has everything from fruits to car parts to electronics to livestock. Edgar introduced us to pulque, another agave-based alcohol, which is served chilled and tastes like delicious, drinkable vinegar. The plazas in Guadalajara are beautiful, and best of all free to enjoy. Camping in Guadalajara. Not exactly 'stealth'. The next place we were offered to stay at was in Mexico City, at Salem’s friend’s apartment for a few days, her neighbor owned and ran a guarded, off-street parking area that we paid 60 pesos a day to use. We didn’t have much time to get out and see the city except for the small restaurants and tiendas in our neighborhood. We went out to a neighborhood across town for some drinks, and were extremely surprised by how pricey it was, comparable to an American bar. Also, the size of the city was extremely intimidating. At the 2nd largest city in the world, it’s hard to know where you should begin, especially if you’re traveling cheaply and driving. Our missed connection (re: trouble with international phones) in Puebla meant we had to look for a place to stay in the dark. We didn’t want to leave the cobbled streets and colorful buildings we saw behind, but this was one of those times where we had to realize we can’t see it all, even with the freedom the van gives us. So we camped in a parking lot outside of town that we were stuck in for the night because of the thick layer of mud beneath the tires. Rainy season hazards. We had two more days of driving, and two more nights, until the next stop with a friend. The first night we haggled for a stay in an abandoned lot (albeit a very nice one) after we tried to drive onto it without asking. The next night, near Cancun, we found ourselves in a Caribbean beach town called Ciudad del Carmen that, like Baja, it was okay to drive on the beach and camp and no one would bother you. Andy's beautiful home in Cancun. Our next stay was in Cancun. As far as camping in Cancun, we didn’t do any of it. Our friend, Joel’s penpal Andrea, lived behind a walled gate, and we slept in the guesthouse. The city of Cancun was built in the 70s for tourism, but not for tourists like us who are broke and bring their accommodations with them everywhere they go. Nevertheless, we saw the white sand beach with a local and ate at a dirt cheap quesadilla place called Quekas, as well as being around to see Mexican Independence Day. Our last night in Mexico, we were driving around a small town near the Belizean border having no luck at all. We asked an elderly gentleman on the side of the road if there was anywhere we should camp, and he pointed us down a driveway. We drove down the road to find two houses, and after some back and forth between neighbors about who owned the land we wanted to sleep on, one of them agreed to let us park the van there. The GoWesty Swing Away system in action. Can’t miss: Joel’s pick: Mazatlan, based on the people met and food we found—refreshing experience. Aidan: Guadalajara, because it’s a large Mexican city full of culture that we saw through the eyes of a local. Madison: the drive between Tepic, Guadalajara and Mexico City because of the high elevation and foggy valley and mountain scenery. Parker: Sayulita, because of its fun, beach town vibe.